The story of Adam and Eve, and what happened in the garden of Eden, has some bizarre aspects to it which seem to have been completely overlooked by the mainstream. Here's the entire story, followed by my analysis. Genesis 2:15 And the LORD God took the man, and put him into the garden of Eden to dress it and to keep it. And the LORD God commanded the man, saying, Of every tree of the garden thou mayest freely eat: But of the tree of the knowledge of good and evil, thou shalt not eat of it: for in the day that thou eatest thereof thou shalt surely die. And the LORD God said, It is not good that the man should be alone; I will make him an help meet for him. And out of the ground the LORD God formed every beast of the field, and every fowl of the air; and brought them unto Adam to see what he would call them: and whatsoever Adam called every living creature, that was the name thereof. And Adam gave names to all cattle, and to the fowl of the air, and to every beast of the field; but for Adam there was not found an help meet for him. And the LORD God caused a deep sleep to fall upon Adam, and he slept: and he took one of his ribs, and closed up the flesh instead thereof; And the rib, which the LORD God had taken from man, made he a woman, and brought her unto the man. And Adam said, This is now bone of my bones, and flesh of my flesh: she shall be called Woman, because she was taken out of Man. Therefore shall a man leave his father and his mother, and shall cleave unto his wife: and they shall be one flesh. And they were both naked, the man and his wife, and were not ashamed. Now the serpent was more subtil than any beast of the field which the LORD God had made. And he said unto the woman, Yea, hath God said, Ye shall not eat of every tree of the garden? And the woman said unto the serpent, We may eat of the fruit of the trees of the garden: But of the fruit of the tree which is in the midst of the garden, God hath said, Ye shall not eat of it, neither shall ye touch it, lest ye die. And the serpent said unto the woman, Ye shall not surely die: For God doth know that in the day ye eat thereof, then your eyes shall be opened, and ye shall be as gods, knowing good and evil. And when the woman saw that the tree was good for food, and that it was pleasant to the eyes, and a tree to be desired to make one wise, she took of the fruit thereof, and did eat, and gave also unto her husband with her; and he did eat. And the eyes of them both were opened, and they knew that they were naked; and they sewed fig leaves together, and made themselves aprons. And they heard the voice of the LORD God walking in the garden in the cool of the day: and Adam and his wife hid themselves from the presence of the LORD God amongst the trees of the garden. And the LORD God called unto Adam, and said unto him, Where art thou? And he said, I heard thy voice in the garden, and I was afraid, because I was naked; and I hid myself. And he said, Who told thee that thou wast naked? Hast thou eaten of the tree, whereof I commanded thee that thou shouldest not eat? And the man said, The woman whom thou gavest to be with me, she gave me of the tree, and I did eat. And the LORD God said unto the woman, What is this that thou hast done? And the woman said, The serpent beguiled me, and I did eat. And the LORD God said unto the serpent, Because thou hast done this, thou art cursed above all cattle, and above every beast of the field; upon thy belly shalt thou go, and dust shalt thou eat all the days of thy life: And I will put enmity between thee and the woman, and between thy seed and her seed; it shall bruise thy head, and thou shalt bruise his heel. Unto the woman he said, I will greatly multiply thy sorrow and thy conception; in sorrow thou shalt bring forth children; and thy desire shall be to thy husband, and he shall rule over thee. And unto Adam he said, Because thou hast hearkened unto the voice of thy wife, and hast eaten of the tree, of which I commanded thee, saying, Thou shalt not eat of it: cursed is the ground for thy sake; in sorrow shalt thou eat of it all the days of thy life; Thorns also and thistles shall it bring forth to thee; and thou shalt eat the herb of the field; In the sweat of thy face shalt thou eat bread, till thou return unto the ground; for out of it wast thou taken: for dust thou art, and unto dust shalt thou return. And Adam called his wife's name Eve; because she was the mother of all living. Unto Adam also and to his wife did the LORD God make coats of skins, and clothed them. And the LORD God said, Behold, the man is become as one of us, to know good and evil: and now, lest he put forth his hand, and take also of the tree of life, and eat, and live for ever: Therefore the LORD God sent him forth from the garden of Eden, to till the ground from whence he was taken. So he drove out the man; and he placed at the east of the garden of Eden Cherubims, and a flaming sword which turned every way, to keep the way of the tree of life. Genesis 3:4 And the serpent said unto the woman, Ye shall not surely die: 3:5 For God doth know that in the day ye eat thereof, then your eyes shall be opened, and ye shall be as gods, knowing good and evil. From these verses, one is hard pressed to escape the conclusion that God lied, and the serpent told the truth. And yet, it seems unlikely to me that the author of this story meant to imply that God was a liar and the serpent was the good guy. But what was his intent? What did he expect us to conclude? It was only after I contemplated the big picture that eventually, an idea began to form in my mind, and the more I considered it, the more it seemed to make sense. What follows is that idea, my resolution of this strange story, a resolution which acknowledges the story's face value—that God lied—but which portrays him as winking at us down through time. Virtually everyone with whom I've spoken regarding this story seems to agree on at least one point: it seems like it was a set-up. Could it be that God secretly wanted them to choose to eat from this tree? He plants this special tree in the middle of the garden—on display, as it were—and says to Adam and Eve, do not eat from this tree...this one right here. At this point I like to imagine that God turns to us, the audience, and winks, as if to acknowledge that we all know it will be only a matter of time before their curiosity gets the better of them, and they will succumb, though apparently it became necessary to coax them into it. No problem: exit God stage left, enter the 'serpent', stage right. Genesis 3:1 Now the serpent was more subtil than any beast of the field which the LORD God had made. And he said unto the woman, Yea, hath God said, Ye shall not eat of every tree of the garden? And the woman said unto the serpent, We may eat of the fruit of the trees of the garden: But of the fruit of the tree which is in the midst of the garden, God hath said, Ye shall not eat of it, neither shall ye touch it, lest ye die. And the serpent said unto the woman, Ye shall not surely die: For God doth know that in the day ye eat thereof, then your eyes shall be opened, and ye shall be as gods, knowing good and evil. With that, Eve had to make a judgment: who's telling the truth, the serpent or God? God says the fruit is fatal poison. The serpent says the fruit is not poison, and seems to imply that it's what God eats to make him full of knowledge. 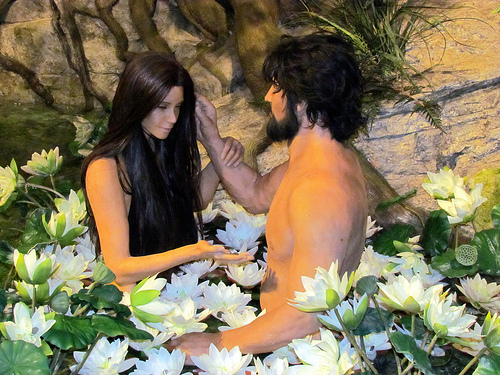 Eve considered some facts: the tree was located right in the center of the garden, where God often came down for a visit, as described in The First Book of Adam and Eve. This was God's spot, and he planted that tree here, and this is what he eats that makes him so wise. And it would make little sense that such a beautiful fruit would be poison. Whether or not God was lying, Eve clearly thought he was—she must have, for she would not willingly eat poison. It seems to me quite inappropriate to call this a sin—how can it be a sin to disobey someone if you think they're lying to you? If God wanted Adam and Eve to eat of the forbidden fruit, then it would seem outrageous to turn around and punish them for it. But did he punish them? Let's now take a look at these supposed punishments, beginning with that of Eve. This means pain in childbirth, scholars are agreed. And it sort of implies that the animals did not seem to have pain in childbirth, otherwise Eve would not have seemed to be singled out for this punishment. But what in the world could have given God cause to think of deliberately making childbirth painful, as a punishment for Eve? I would like to suggest that it wasn't a punishment, it was a result of how Adam and Eve were created. Here's the idea in a nutshell. What if Adam and Eve were genetically engineered hybrids, say a cross of the genes of the Elohim, those who said "Let us make man in our image", and the genes of the native earth apes. Let's further suppose that this influx of genes from the gods caused the human brain to become much larger than it was in the apes. Scientists now agree that modern man has triple the brain size of his nearest ancestor. A larger brain requires a larger head to contain it, and the larger head of a baby would cause more pain during birth. Let's further assume that for some unknown reason it was not feasible to engineer a larger birth canal to compensate. What we're left with, then, is not a punishment of God, but rather a prediction of pain in childbirth, cloaked as a punishment. Going with this theory that perhaps they weren't punishments after all, let's take a look at Adam's punishment. Genesis 3:17 And unto Adam he said, Because thou hast hearkened unto the voice of thy wife, and hast eaten of the tree, of which I commanded thee, saying, Thou shalt not eat of it: cursed is the ground for thy sake; in sorrow shalt thou eat of it all the days of thy life; Thorns also and thistles shall it bring forth to thee; and thou shalt eat the herb of the field; In the sweat of thy face shalt thou eat bread, till thou return unto the ground; for out of it wast thou taken: for dust thou art, and unto dust shalt thou return. But did God really 'curse' the ground in the first place, or was he simply aware that outside of Eden, farming would be hard work? Did he really remove the curse after the flood, or did the flood somehow improve agriculture? Did God punish the serpent? Now here's the punishment of the serpent. Genesis 3:14 And the LORD God said unto the serpent, Because thou hast done this, thou art cursed above all cattle, and above every beast of the field; upon thy belly shalt thou go, and dust shalt thou eat all the days of thy life: And I will put enmity between thee and the woman, and between thy seed and her seed; it shall bruise thy head, and thou shalt bruise his heel. "upon thy belly shalt thou go" implies that the serpent originally had legs, and the LORD now is removing them. Also, he seemed to know a lot, and could talk to Eve, which is something very unlike an animal. His punishment was to be changed into a snake. Personally, I have my doubts that the serpent was ever anything but an actor whose role was to coax Eve into taking the forbidden fruit, according to God's plan. I've wondered vaguely whether perhaps God wanted the sight of a snake to be a reminder to Eve that the serpent's punishment was the greatest of all, as the instigator of the 'crime'. I am left to conclude that if this story is real, and if Adam and Eve were genetically engineered hybrids, then these punishments were not punishments, they were just disguised to look like punishments. Adam and Eve were given an opportunity to acquire the so-called knowledge of good and evil, and they chose to acquire it, to become more like God. What does the author mean by the term knowledge of good and evil? This calls for speculation, but I think one reasonable definition would be the knowledge of the consequences of our actions. We make hundreds of choices each day, and as time progresses, we learn which of our choices produce pain and misery, and which produce love and peace. To Adam and Eve, acquiring the knowledge of good and evil was portrayed to be as simple as eating a particular fruit. But in truth, the knowledge didn't come from eating a fruit, it came from being pushed out of the womb that was Eden, and into the real world, where it is a constant struggle to survive. It is now universally recognized that through adversity, through pain, we grow. Some say pain is the only teacher. So here is my conclusion: For Adam and Eve to truly mature, to become all that they were meant to be, they had to leave Eden, and although this story makes it look like it was a punishment, it seems clear that God always intended us to leave Eden, to migrate down the paths of those four rivers, and multiply, because only in the real world could we truly begin to acquire the knowledge we needed to become strong, mature children of God. We haven't gotten to the part where it says "And they all lived happily ever after", but, we're getting there. Today, more than any other time in history, we are being given remarkable proof of life after death. From the the numerous testimonies of Near Death Experiencers to John Edward's daily television show, Crossing Over, we are more assured than ever before that our lives do continue after we leave these bodies. I believe there is a purpose for our being here, a profit in the pain, and it has all to do with our lives in the world to come. The tree of life is mentioned only twice in our bible: once in Genesis, the first book of the bible, where man begins acquiring the knowledge of good and evil, but is barred from the tree of life, and then again in Revelation, the last book of the bible, wherein the tree of life is promised back to us. Perhaps, then, it's as simple as this: Before we enter that mysterious kingdom of heaven, reportedly a most beautiful world in which there is no pain and great joy, it may be that God wants us to first learn a few things about how to behave. We do seem to learn those things by living here, and what we learn does benefit us. But I also think that in the world to come, through aspects of physics we are only beginning to become aware of, such as telepathy, we will benefit not only from our own experiences, but from the experiences of every human who has ever lived here since Adam and Eve. For if life after death is a fact, then not one of them has died, and they are all waiting for us to join them. With that in mind, I say to you, my fellow human being, it may well be that we have a future so bright, we'll have to wear shades.